not yet received my swag and they promised me a pz 2 j when I was leaving. did not get the pz 2 j they gave me a type 59 instead plus another week of premium and 1000 gold. I am happy with everything they have done for me and will patiently wait for my swag. Happy to see some of you are getting compensation, they haven't offered me anything. Last I heard they don't even have a timeline for shipping seems like this is a low priority for them. I bought tickets for myself and my son, I really can't say I'm very happy with them. Send in a ticket on it you might get something though I am skeptical on the guy getting the type 59 all I got was 1,500 gold and 7 days or premium time no premiums at all. ​I have one ongoing getting a bit of the old run-around. I think eventually I will get some recompense. I got a Church III, 5 days premium and some Chieftain and Meathead emblems. Still waiting for the swag. I did receive the link for the shipping form from support. Edited by oldiowaguy, Aug 02 2017 - 03:47. I did attend the event in Kasota, MN on 15 July 17 and there's something to be said about the whole event and I have some mixed emotions. I would love to have given the event a 10 out of 10 rating, however there were shortcomings that shadowed that and I would leave my experience at a 5 out of 10. Management or lack there of... There was plenty of Chaos from the 90 min wait just to get into the event. It was eventually hammered out, however, I was near the front on the line and waited for approx. 90 min. just to get into the event. The layout of the event was not thought out properly. The main tent set up was really close to the hardened structure and prevented people from moving around smoothly. Under the tent wasn't any better. There were so many tables under the tent and no clear path going through the tent, people with small children and disabilities had a hard problem walking around. Not to mention if there was a medical situation (which there wasn't) it would be problematic. I understand there was limited space available and with working tanks you needed room for people safety, HOWEVER, it should have been someone looking at the confined space and realized a better layout was needed. Lack of communication between WG staff and the event staff and the public. People didn't know where to go, what event what located where, what problems were occurring and how the event staff and WG were doing about the issues, etc. There was no clear communications nor no clear person(s) in charge. The staff did not fully grasp how many people were attending the event. The staff handling the entry with the sign-ins, waivers, swag gear, etc. did not expect the turnout on which they had on their hands. I was told by WG staff, that this was their first event hosting alone and there were issues that came up that were unexpected. This is always the case, but event needed an actual experienced event coordinator that had prior experience with an event like this. When asked about an after actions review or a guest comment (and staff comment) reviews, the WG staff simply said go to forums and fill out a ticket. I am an executive level professional and to hear this is not acceptable. It isn't acceptable from a guest point of view NOR if I was apart of WG staff would it be acceptable. Especially, when I asked for a point of contact to make the next event a better one. Audio and Visual was poor... guests could barely hear when the giveaways were taking place and could barely see anything when the event entered the night time hours. The personal swag gear... people were waiting for hours on end to get their personal swag gear only to be told... if we do not receive it, it would be mailed to our residents. Not to mention they could not produce a good portion of the swag gear to the guests. I will tell you, I am STILL waiting for my swag gear to arrive. The only thing I did received was what was handed out at the door was the bonus codes, a coin, a coupon for a free ride and nothing else. Also, the event ran out of sizes on shirts to where I could not get that... even if I had paid for them. Also, an email notification to acknowledge the issue with the swag gear and the acknowledge of when our gear would be sent to us would be greatly appreciated. The giveaways were good, my suggestion on that would be, to have the giveaways throughout the event with the grand giveaway at the end. 11pm to wait for the giveaways was a bit hard on people that were standing in lines throughout the event, people with disabilities, and families with children. Having the game set ups on computers to where you could fully enjoy the game with the high end graphics was a great bonus. There were considerable wait lines just to see what the game would be like in high def., but people waited and highly enjoyed that. The free food and beverages was great. People were giving really good reviews on the catering and beverages. WG staff was great as well, they represented WG well. Many of them took the time to talk to the people and guests had many opportunities to meet many of the well-known and no so well-known icons of WG. (Side Note... I would have like to see the Chieftain there, but that is just me, would have like to talk with him, Army Veteran to Army Veteran). When speaking with one of your WG staff, I told them, I came from playing WoW and League of Nations to WoT and now ONLY WoT and loved it. (there are some other issues with the game itself, but I will send another ticket for that) I had made mention, I wanted to make the next event even better and wanted to share my thoughts on the event to make it better for WG when hosting another event and for the guest experience. When you have as many people that show their support for a game they love to play, you want to put on an event experience that you can brag about to others (both game players and non-game players). Hopefully, someone higher up will see this and take note of the shortcomings to correct them for future events. If you wouldn't mind, can I please get some feedback on this posting. And if you can see about my missing personalized gear or compensation that would be greatly appreciated. (Side Note... I would have like to see the Chieftain there, but that is just me, would have like to talk with him, Army Veteran to Army Veteran). Sorry, mate. I was off on my honeymoon. Much though I like tanks, even Kasota's tank driving event takes a back seat to that! Hey Wargaming how about spreading some of those extra comps around? 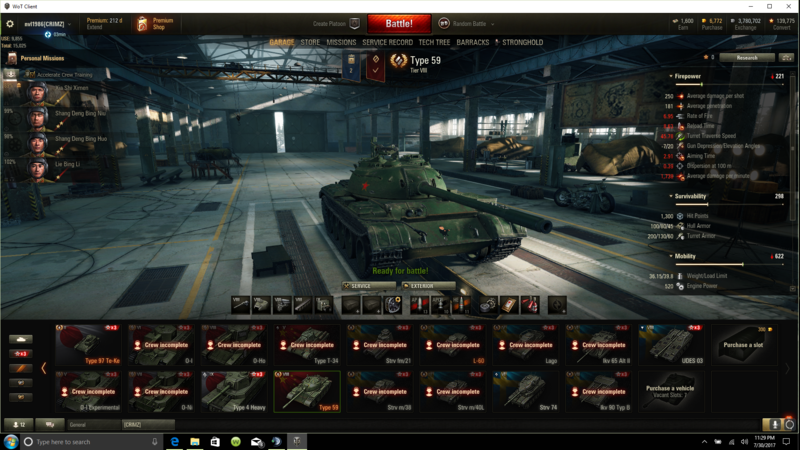 I can guarantee the people that got free premium tanks didn't spend as much time in line my wife and I. There were only three people that rode the Sherman after us and NONE of them play World of Tanks. I know because we spent HOURS talking to them while standing in line. Who you have to know to get the extras? I was given a "direct" email link for the event management in my support ticket 4 days still waiting for a response. The event the let’s battle tour Kasota seemed like a good event to everyone that first signed up paid $22 you were promised a customized T-shirt, messenger bag, and customized name tag. I was watching the videos every week looking for information on the event and only got 45 seconds of information about it and this article which I will link https://worldoftanks...ts/ride-a-tank/ . Notice how it says there that you get customized merchandise as I have described above. Only two videos mentioned the Let’s battle tour https://www.youtube....h?v=WLp5zODWIU0 and another video was missing at first and is now back online https://www.youtube.com/watch?v=9598_2Gh0TQ . http://imgur.com/a/cv5vO was missing at first as you can see here this was taken on the day of the event. The point being is that little information was available to people going to the event except an email we got two days before the event and the two articles put out on it. The Let’s Battle Tour was disorganized at the start we got there my grandfather and I at 4:30pm. Nobody was checked in for at least a half an hour even though there were over 100 and many more behind us. Each truck brought in 20 people over 12 times in the half hour before the event. With many more trucks bringing in more people as we waited. The wait was a half an hour, then came the tank line which was supposed to be organized by tiers 1-10. This is where it get’s interesting, I was physically within earshot to hear one of the Drive A Tank personnel say to the employees running the tank rides say the following “Wargaming just told me that we are sending anyone who doesn’t want to drive the half-track or Abbot Apc back to the end of the line and have everyone line up single file.” Pretty shocking since the Sherman was what a lot of people wanted to ride. But to have to wait a half-hour to an hour and then being told you have to go to the back of the ever longer line was just plain garbage on wargaming’s part. Was that really said yes it was, and I can only imagine how mad people were to be told that after waiting a half hour to an hour in line. This event had over 500 people from what I counted. Later in the day those lines got even longer and more people had to be sent to the back of the line. This is just poor planning on Wargaming’s part, you see the original plan was to have an hour for each tier and 3 vehicles transporting people around the course. The Abbot APC, a half-track, and a Sherman easy 8 with the maximum capacity of all three being 23 people. I can imagine the shock of having so many people at an event like this but didn’t Wargaming know the amount of tickets they sold? Yes, because they prepared plenty of food for the event one of the good things it had going for itself really. So the question is why not a better system of organization? I can think of two possibilities one they didn’t know how many people were going to show up or two they just didn’t care. Let’s discuss both option one they didn’t think so many people would show up. Could be possible to consider this considering the lack of staff checking people in at first and the fact that the tier system was designed for only so many people. OR it was simply they didn’t care. This could be evidenced toward there being plenty of food and the quote from the let’s drive a tank personnel. For me it is the first since they didn’t have too many people checking people in only 5 with Tragic Loss handing out waiver forms. These are required by federal laws and such for business of this nature. Let’s say you were finished with tank rides and eating food then what would you do? The obvious answer being hang out with friends and wait for your customized messenger bag and t-shirt. Yes, there was a bingo twitter, Instagram contest involving taking photos of tanks, players, and Wargaming employees. That only took like 30 minutes to do at most to win a t-shirt or other prizes. Then yes you could play out the game stations which were only so many. Then there was waiting to get your customized merchandise which you were supposed to get a text for. Waited two hours still nothing then you hear the rumor “they are only giving t-shirts to those that stand in line” an anonymous person told me. So we stood in line my grandfather and I for three hours and no text and no line movement. I have submitted a ticket and I suggest to those that haven’t to submit one as well. Now onto the finale. In conclusion, the event did cost a lot of money for Wargaming to put on. The normal cost of riding a tank was $300 down to $200 with Groupon with bigger packages ranging from $1000-$5,000 for tank crushing and driving the easy 8 and t-55. To be transparent Wargaming covered these costs for the Abbot Apc, The half-track, and the Easy 8. What could wargaming have done better? Organize put a schedule out and make announcements when things change. The event was okay in my opinion , but could have been made a lot better if it had been properly organized. I submitted a ticket to support asking for the messenger bag and the t-shirt to be sent to me and for some sort of compensation. I will conclude this piece by leaving my ticket and their response. ​I take it back! You got a type 59, and I got a Church III! Lucky me!!!!!!!!!! Come on WG, why do some get tier VIII and others get tier Vs??? My son, iowakid, hasn't received anything! Granted I paid for his ticket, but he waited in the same lines, in the heat as the rest of us. I really hope they ship his swag at the same time! I don't get it either I sure waited for over 3hours in that dam swag line and nothing. they just putzed around not making anything. Saw a woman march up there and take a few blank shirts and boy was she pissed. I did forget a couple of other notes about the Kasota WG Event. WG staff made mention once...maybe twice, about the real reason for the event. Project V.A.L.O.R. was mention one time at the very end of the event to where no one was really listening. That should have been the main theme for the event. As US Army Veteran, and knowing the reason behind the event is a big part of why I decided to attend. Shortly after the doors opened, people flooded through and making their way into the event. Many went to play on the Game stations, however a large mass of people went to stand in a long line to ride in a Sherman. A lot of people were not told (while standing in line) what the Tier Ticket was for and didn't learn this until attempting to get in line for the ride-along. Shortly thereafter, they did away with the Tier Tickets and it had become just one huge long line in the 90+ degree heat. Once again, that goes back to mis-management of the event. Finally, when you sign up for a VIP status and don't get what you signed up for. It really took away from the event. You didn't get anything more or less than anyone else and it was not anything that would have made it seems special. I agree with you fully my grandpa was with me and it was hard on him to wait in all those lines. Not to mention he lived 3 hours north and I lived two hours north. It was a lot of driving for sure I wish I could get Wargaming to listen but repeated attempts over twitter and through contacting blogs to accept the article I wrote which I eventually published here instead just show the timidness of the community to speak the truth and you sir are very accurate in your review. It is even more disappointing to you and me both for being vip's and not receiving the merch that was promised to us both. Even though I filled out the form for it still no response two weeks and a few days counting. It takes people like you and me to speak up to get their attention. so thank you. Edited by landedkiller, Aug 02 2017 - 20:27.